BOSTON, Mass. – The Institute of Public Speaking, an international public speaking and leadership training organization, announced today that registration is now open for its newest course, Persuasive Communication Skills. The course explores the science behind the power of persuasion and gives students the tools to effectively use it. Through hands-on persuasion training and interactive activities and exercises, students will gain an understanding of the fundamentals of effective communication, master the science behind persuasion for success in career and life, learn to be more persuasive communicators and master the building blocks of public speaking, presentations and pitches. Participants will also learn to expand listening skills, learn tried and true methods to build influence and rapport, become expert negotiators, and discover the importance of emotional intelligence and more. Students are video taped during persuasion training exercises and practice speeches to help build confidence and self-awareness. They will also benefit from one-on-one time with expert trainers in a small class setting to ensure the best learning outcome. Guarino has over 15 years of expertise in public speaking, leadership and communications training. Under his leadership, the Institute of Public Speaking has helped thousands of students master persuasive public speaking and other essential communications skills. The institute’s trainers’ experience spans nearly every industry and venue and they are committed to helping each and every student that enrolls take the next step to becoming an expert persuasive communicator. The Persuasive Communication Skills class will be available in Boston, MA, Providence, RI, Manchester, NH and worldwide. Registration is $499. To register, visit www.instituteofpublicspeaking.com. 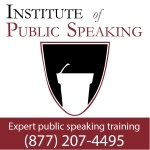 Based in Boston, Massachusetts, the Institute of Public Speaking is an international public speaking and leadership training organization. The curriculum is science based and designed to help propel trainees forward in their careers and in life. For more information and to register for courses, visit www.instituteofpublicspeaking.com. Stay connected at www.twitter.com/ipublicspeaking. 2 Responses to "New Persuasive Communication Skills Course"
I have always called this “the art of persuasion” because it is just that, an art! It is something everyone has access to but not many know how to fully grasp it and use it for their own advantages or for good. I enjoyed this read a lot, really put things in perspective. Thanks! Wow, this course sounds really great and interesting! I have always wanted to attend communication skills course but have never found the right one for me.. Gladly, I have just visited your page and these courses looks very useful. I really hope I could join you, that would be perfect!